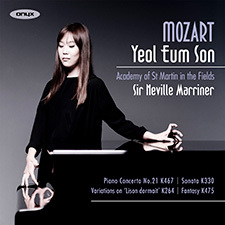 Mozart’s most popular piano concerto, No.21 in C major, forms the centrepiece of this all-Mozart album from Yeol Eum Son, who has rapidly become one of the most sought-after young pianists in the world. The concerto recording was sadly the very last made by Sir Neville Marriner, and it is fitting that it should be of this great Mozart concerto, with the Academy of St Martin in the Fields, the orchestra he founded in 1958. Together they made many fine recordings of Mozart, including the soundtrack to the film Amadeus.